Quito. 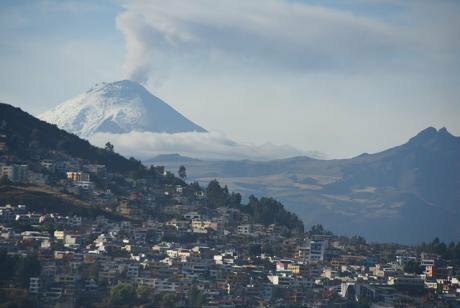 Cotopaxi, 2015. Flickr/Bob. Some rights reserved.Cities, not nation states, are defining the shape and character of security and development in the twenty first century. Decisions being made in fast-growing cities in Africa, Asia and the Americas are determining the future trajectories of everything from climate change to migration. Although many commentators are mesmerized by the power and potential of 100 or so global cities, virtually nothing is known about thousands of cities that are much less prepared to cope with tomorrow´s crises. The good news is that some cities are stepping-up to solve major global challenges. Mayors are forging networks within and across international boundaries to address shared problems. Part of the reason they are doing this is because multilateral institutions and nation states are increasingly unable to solve many of the world´s most intractable issues. The United Nations Security Council and General Assembly are not much help, focused as they are on member states rather than cities.Though a handful of cities are booming and rewiring international affairs, many more are falling behind. In some cases, the social contract that binds urban authorities and citizens is coming unstuck. When a disequilibrium of expectations occurs between municipal leaders and residents, cities become fragile. An index of fragility is the extent of local service provision – whether public security, health, transportation, or basic utilities.In order to alert national and federal governments, business and civil society to the dimensions of city fragility, the Igarapé Institute, United Nations University, World Economic Forum and 100 Resilient Cities developed a data visualization platform - fragiliecities.igarape.org.br . Seed funding was provided by the Canada´s Global Affairs and other partners. It is one of the largest publicly available repositories of data on cities in the world. The platform includes information on over 2,100 cities with populations of 250,000 or more. Cities were graded across eleven variables and given a score between 1-4. Variables range from city population growth, unemployment and inequality to pollution, climate risks, homicide and exposure to terrorism. The data visualization allows users to explore the data and better understanding the types of risks facing fast growing cities. The data visualization platform shows that fragility is much more widely distributed than assumed. 14% of all 2,100 cities can be considered very fragile (scoring 3-4) including Kabul, Aden and Juba. Another 67% of the cities report average levels of fragility (with an index score of 2-3) ranging from St Louis to Valencia. And just 16% of all cities report low fragility (0-1) including Canberra, Sarasota, and Sakai. Roughly 4% of all cities had insufficient data to register a score at all.The regions registering the lowest city fragility include Western Europe, East Asia and North America. Interestingly, there are no highly fragile cities in Europe, while 52% of its cities experience medium fragility (2-3) and 47% are reported as having low fragility. The Americas - including North, Central and South America - features the highest number of cities with medium levels of fragility (78%) and just 4% with high rates of fragility.The fragile cities data visualization was launched at the Global Parliament of Mayors from 10-12 September and the Secure Cities conference in Stockholm on 15 September 2016. The Igarapé Institute presented the tool to mayors, urban planners, and security specialists. We are also hosting a showing at Habitat III in Quito next month. The platform is designed to improve awareness and action on challenges facing cities around the world, but also to highlight our many gaps in knowledge.